If you enjoy checking and using social media on your mobile phone as you go about your daily life, you are certainly not alone. 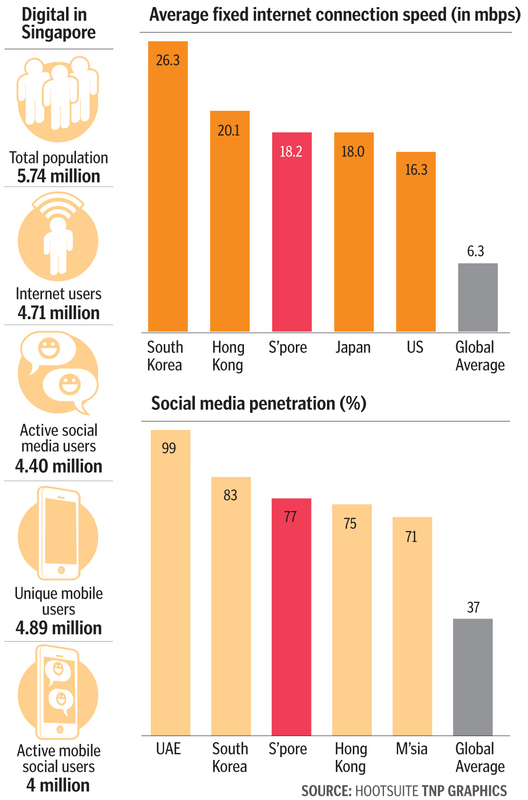 A report on social media and digital trends that has just been released shows that seven in 10 Singaporeans are active social media users on the go - more than double the global average of 34 per cent. The Republic ranked third, behind the United Arab Emirates (99 per cent) and South Korea (83 per cent). The report, titled Digital in 2017, was produced by Hootsuite, a social media management platform, and We Are Social, a social media agency. It compiles data of studies of online behaviour from over 200 countries and territories conducted by organisations such as GlobalWebIndex, GSMA Intelligence, Statista, and Akamai. The report also said that more than three in four Singaporeans now use social media, up 22 per cent from last year, with 800,000 new users joining. Again, this growth, ranked 10th in the world, was more than the global average of 21 per cent, with Saudi Arabia topping the list at 73 per cent. Singapore's average fixed Internet connection speed, at 18.2mbps, was also found to be close to three times the global average of 6.3mbps. While there are obvious benefits of being connected, the proliferation of connectivity online could also be a double-edged sword, said National University of Singapore sociologist Tan Ern Ser.The findings come as telcos here were reported to be closing in on 1Gbps mobile surfing speed and bringing Singapore closer to 5G services - which are 10 times faster than 4G ones. "They allow us a greater reach and access to information and social networks, regardless of time and space. "However, they can also lead to over-distraction, waste of time or echo chambers of misinformation or propagation of prejudices, stereotypes, and hatred," he said. PRecious Communications managing director Lars Voedisch shared that sentiment, noting how a recent video of rats in a restaurant made its rounds on social media purporting to be a scene at an eatery here. Dr Michael Netzley, a social media expert from Singapore Management University, also said there could be ramifications of becoming a "truly networked society". First, overuse of mobile devices or laptops means users are in a state of continuous partial attention, he said. This, coupled with the constant switching between tasks, could leave users with a reduced mental bandwidth - similar to an eight-year-old's - allocated to any task or situation, he said. Mr David Freer, vice-president of consumer Asia Pacific at Intel Security, said the widespread use of social media could also lead to cybersecurity issues. "People are connecting to social media via their Smart TVs or fitness trackers, which store plenty of personal information or metadata that is highly attractive to cybercriminals. "Yet many new Internet of Things devices coming to market have weak or no security," he said. He advised users to surf wisely, such as to always fact-check articles online with reliable news sources or to flag inappropriate content to the social media platform and authorities. Dr Netzley said: "The responsibility to seek out diversity online is an individual responsibility. "So any effort to create a smart nation filled with people who are smart about using technology must ultimately (educate) individual users and the choices they make."